The solution is simple to customize the short Image Tool-Tips on Removable Driver for File-Manager Q-Dir and MS-Explorer! This solution in not only for Windows 7 but also for Windows 8, 8.1 and XP! For MS-Explorer and other shell based file manager like Q-Dir! It comes to this image files ToolTip problem, on slow USB drives and SD cards. 1.) ... Default Short Tool-Tip in Windows! 2.) ... Customized Tool-Tip in Windows for images! 3.) ... The Solution to customize the image Tool-Tips in Windows! 1.) Default Short Tool-Tip in Windows! (Image-1) To short Image Tool-Tips on Removable Driver on Windows! 2.) Customized Tool-Tip in Windows for images! (Image-2) Customize Image Tool-Tips for Removable Driver (USB,SD-CARDS)! 3.) The Solution to customize the image Tool-Tips in Windows! Please download it an run (via Double-Click) the Image Tool-Tips Registry-Script! (Image-3) Longer Image Tool-Tips on Removable Driver for all Windows OS! 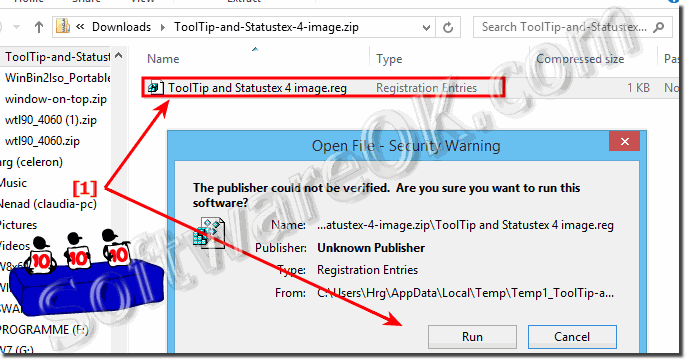 (Image-4) To short Image Tool-Tips on Removable Driver Registry-Script! 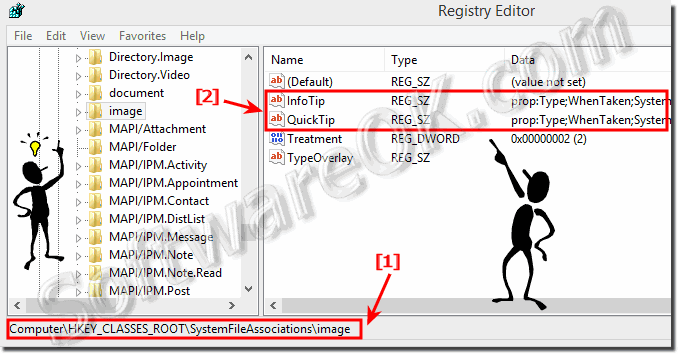 Windows-7 - FAQ-99: To short Image Tool-Tips on Removable Driver in Q-Dir and MS-Explorer! I have used Portable Q-Dir on my XP laptop for some time and it works very well :-) . I have now bought a new laptop with Windows 7. I notice that the "pop up" box when mouse pointing at an image file no longer shows the file dimensions (eg 800x600), only the file type, size and date. But this only happens if the file is stored on a flash drive or SD card - on a conventional HDD it still shows the dimensions. I keep most of my working files on the SD card, and this makes it difficult to quickly see what size the pictures are in "List View". ?